Sunrise View from Sarangkot early morning you will see amazing view of whole Annapurna range mountain, Fish tail mountain and many mores and continue our bike tour on a rocky but quiet Jeep trail into Pame. This village community is an interesting cultural destination, and we’ll head back to Lakeside with a camera filled with pictures. This trip provides variety and adventure. With many trails and sights, our guides will cater your ride to match your ability level and interest. Those wanting an easy ride can take a Jeep to Sarangkot to enjoy the view. We’ll zip downhill to Naudanda for lunch and continue our tour on a rocky but quiet Jeep trail into Pame. This village community is an interesting cultural destination, and we’ll head back to Lakeside with a camera filled with pictures. Ready for a challenge? 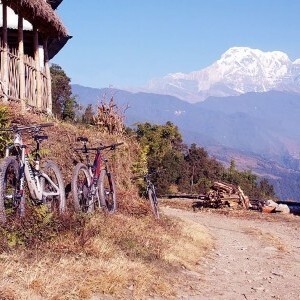 Pedal up to Sarangkot with one of our guides. You’ll reach an elevation of 1500m — a tough ride but well worth the effort. With a panorama view of the Himalayas and friendly locals to greet you, this trip explores exciting single tracks and charming village communities,You will be riding around 30 kilometres today.